One of the folks from the birdnet sent a link to a blog written by someone in Iraq – a soldier working in a medical unit. It’s nice to read about something in Iraq that’s not war related, and to get some idea about what the country is like apart from the war. 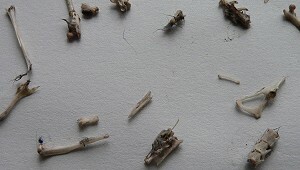 One non-machine related thing I did this week was to dissect some of the bird pellets that I found last week. The ones from the nest box were composed of beetle shells and animal hair. The beetles were dark brown/purple, and looked large – Junebugs? On our way back to the city, along the Buffalo River valley, we saw thousands of blackbirds flying in a long flock – it must have stretched at least a mile. And all along the road there were trees and cattail marshes full of roosting blackbirds. I’ve never seen so many at one time.